My version of the notched straightedge is made from 1/8″ thick acrylic that I bought from a local store for about $11 for a 18×24″ piece. 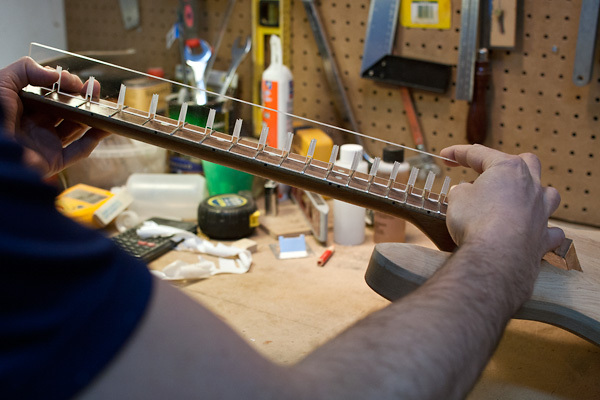 As it turns out, 18″ is the perfect length for this tool for an electric guitar neck. 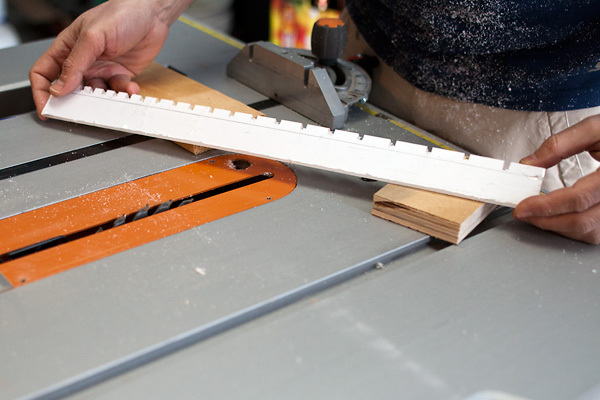 And at 24″, you can make about 16 of them… At this price you can make a notched straightedge for each scale length. 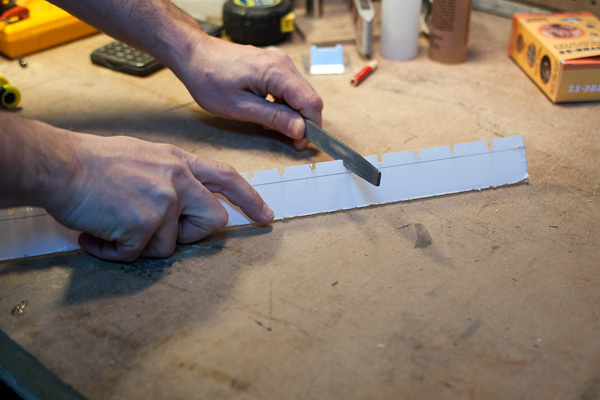 Step 1: Cut a 1.5 x 18″ strip of acrylic. 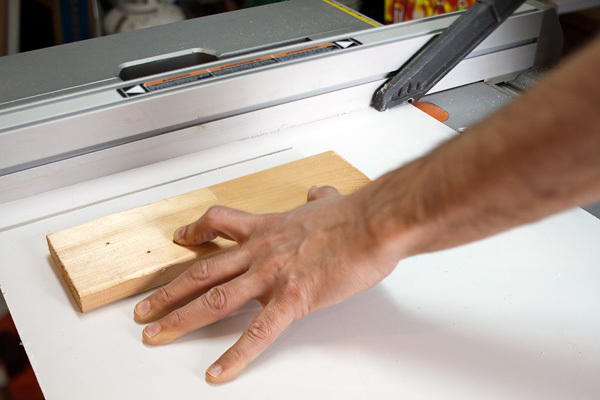 This will be the most critical step in the process because you need to make sure that you cut a perfectly straight line. I used my table saw that I know and trust to give me a straight line. 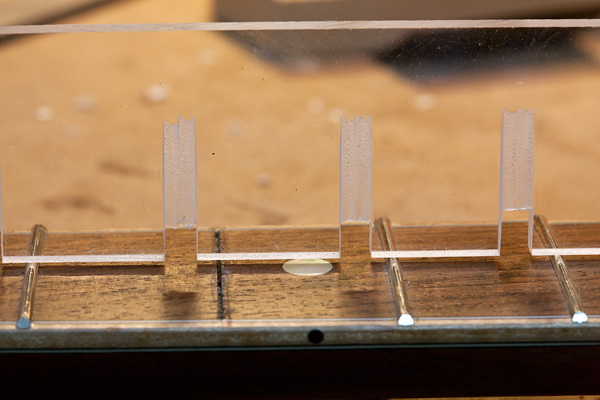 You can also use different methods to cut acrylic, such as scoring & snapping (do a Google search for that method). 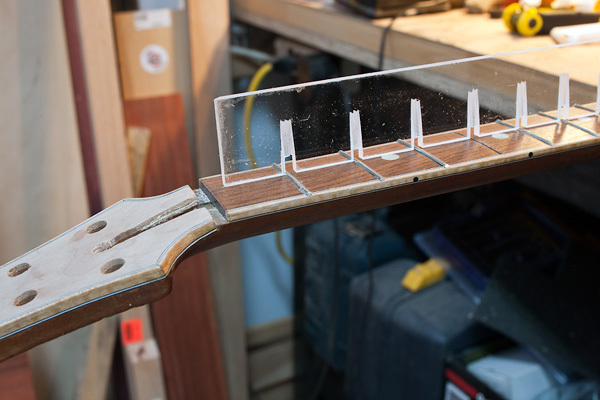 On the table saw, I adjusted the blade so it was about 1/8″ higher than the height of the acrylic. 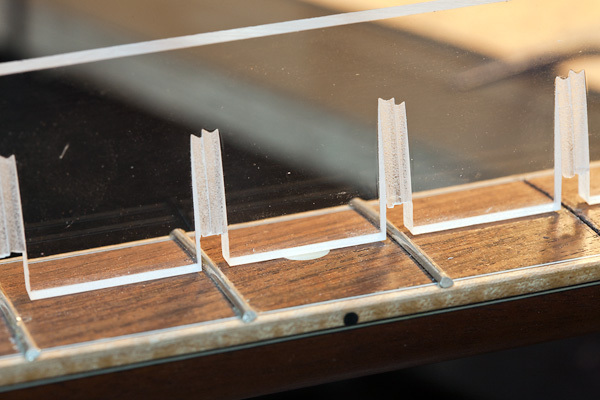 The rip fence was adjusted to 1.5″ from the blade and I used a piece of wood to press down on the acrylic sheet and pushed the piece though with a push stick. Acrylic dust is not very pleasant to breath so I wore a breathing mask. Glasses and ear protection as well. The new edge will be a bit rough so I sanded it lightly with 400 grit paper. I’m using clear acrylic that has protective white covers on each side. These will be removed at the end. Step 3: Cut the notches. 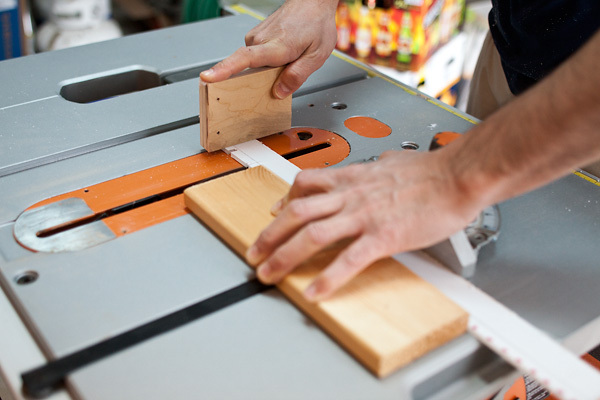 Without changing the blade height of the table saw, I made two passed for each fret mark. I used the miter gauge and a piece of wood to make sure the cuts were perfectly perpendicular. Since acrylic is relatively flexible, I also supported the end part with another piece of wood (see image). Take your time and do a good job. Here’s what it looks like with all the notches cut… Notice all that acrylic dust on my shirt! Don’t forget your breathing mask. At this point the notches will be pretty rough from the table saw blade so pass a file in the notches to clean them out. 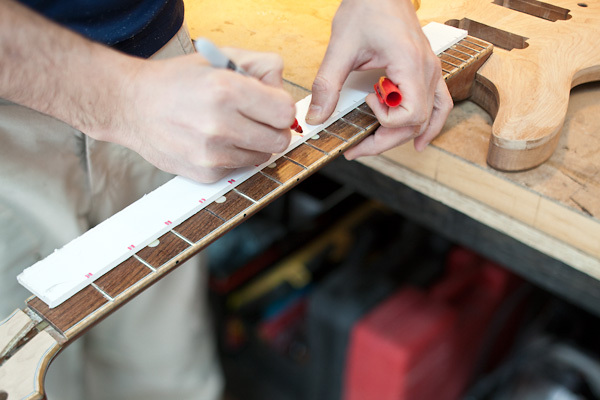 You can also check the height of the frets by placing the straightedge on the frets. Please leave me a question, comment or suggestion below in the comments section. I made a similar set of notched rulers using Aluminum, purchased at a metal supplier for about $8. Dimensions were 31.8mm (1-1/4″) x 3.2mm (1/8″) x 3050mm (10′). The material’s edges were quite straight against my 4 foot level. I marked the notches as you did, and made my notches by cutting about 10mm (~3/8″) deep with a jigsaw on each side of the mark, then scored a line across the top of the cuts using a utility knife. I flexed the piece to be removed with pliers, side to side until it cracked. Scoring well made nice clean breaks. I cleaned up the notches with a file, checked against my known straightedge for distortion, and marked each with scale length information. A hole at one end allows wall hanging. The accuracy is good, and the cost for making several different notched rulers was $8 and a few hours. Thanks for the detailed description Jim. I think metal is more accurate than acrylic for this kind of tool. I will probably end up making an aluminum version in the future. I would think you should make the cuts in the acrylic with the piece vertical & a scrap on either side, mark your scraps first & either screw or clamp them together.. I made a base for my homemade router table from polycarbonate & a 12″ x 14″ piece cost me $20, I don’t know how you were able to assume that the pieces cost $1?? If you went to Home Depot you’d better have $40 to spend to get a 18″ piece more than a 1/4″ thick, more if you’re making one for 34/35″ scale bass.. I too would think that aluminium would be better than acrylic & a metal cutting 7 1/4″ saw blade can be put in your 10″ table saw to make the cuts.. 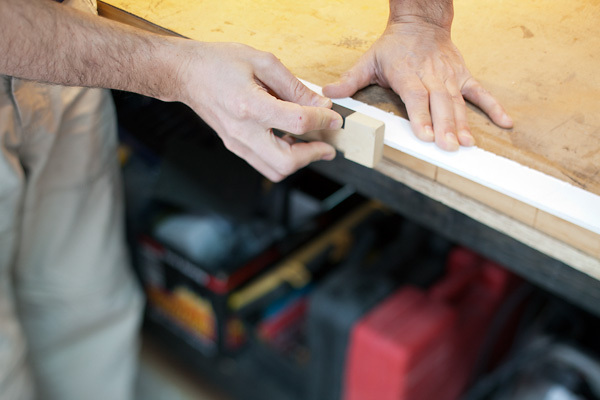 I always find myself wanting a precise long straight edge & other than a wooden yard stick I have a couple carpenters framing squares which just aren’t long enough & are not slotted..
You are right, running the piece vertical would eliminate those tapered cuts. Using metal would definitely make it better. 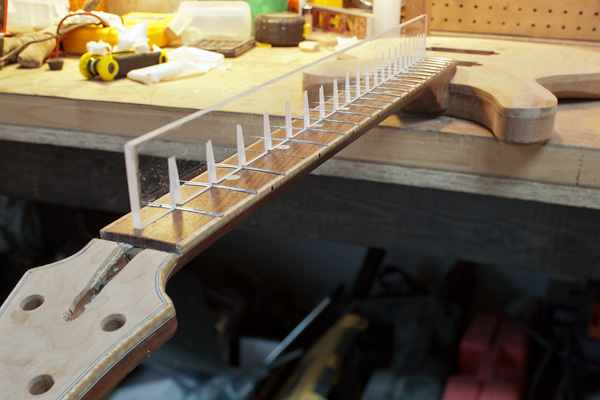 Excellent project….u say….can also check the height of the frets by placing the straightedge on the frets……..
More confusing….after Google…..what exactly are the Notches for and what does one measure with the notches that a normal steel or plastic ruler cannot? Help.